The OGs are back on top! At tonight's NJPW: Fighting Spirit Unleashed event at Long Beach, Bullet Club OGs Tama Tonga and Tanga Loa, collectively known as The Guerrillas of Destiny, won the IWGP Tag Team Championships by beating The Young Bucks in a stellar match. Ever since their transition to the heavyweight tag team division in NJPW, the dynamic duo of Matt and Nick Jackson have enjoyed tremendous success by not only sharing the ring with some of the finest tag teams in the world, but also capturing the IWGP Heavyweight Tag Team Titles for the first time in their careers. Earlier this year at Dominion 6.9, The Young Bucks defeated Los Ingobernables de Japon representatives Evil and Sanada, to win the IWGP Tag Team Titles for the first time and since then have also gone on to defend their tag titles at NJPW: G1 Specials in San Francisco as well. 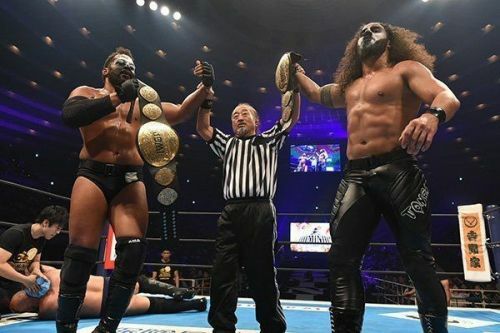 At tonight's NJPW: Fighting Spirit Unleashed, Tama Tonga and Tanga Loa, The Guerrillas of Destiny, won their record fourth IWGP Tag Team Championship belts following their spectacular win over The Young Bucks at the Walter Pyramid. Throughout the match, both Tama Tonga and Tanga Loa worked on Matt Jackson's previously injured lower back and thus forced The Young Bucks to somewhat limit their moveset. This eventually led to both Tama and Tanga taking advantage and subsequently getting the pinfall win in tremendous fashion. With their father Haku in their corner, The Guerrillas of Destiny became four-time IWGP Tag Team Champions, bringing an end to The Young Bucks' first title reign in the process as well. With The Young Bucks now losing the IWGP Tag Team Titles, it remains to be seen what the future holds for both Matt and Nick Jackson. A move to the WWE could very well be on the cards, given that their current contracts with ROH and NJPW are all set to expire in a short period of time.